Carbon Composites: Composites with Carbon Fibers, Nanofibers, and Nanotubes, Second Edition, provides the reader with information on a wide range of carbon fiber composites, including polymer-matrix, metal-matrix, carbon-matrix, ceramic-matrix and cement-matrix composites. In contrast to other books on composites, this work emphasizes materials rather than mechanics. This emphasis reflects the key role of materials science and engineering in the development of composite materials. The applications focus of the book covers both the developing range of structural applications for carbon fiber composites, including military and civil aircraft, automobiles and construction, and non-structural applications, including electromagnetic shielding, sensing/monitoring, vibration damping, energy storage, energy generation, and deicing. In addition to these new application areas, new material in this updated edition includes coverage of cement-matrix composites, carbon nanofibers, carbon matrix precursors, fiber surface treatment, nanocarbons, and hierarchical composites. 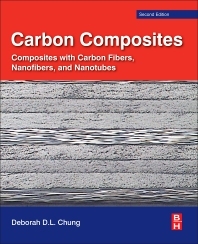 An ideal source of information for senior undergraduate students, graduate students, and professionals working with composite materials and carbon fibers, this book can be used both as a reference book and as a textbook. Composite Materials Research Laboratory, University at Buffalo, State University of New York.